We have owned our Berkey Water Filter (Amazon) for over ten years. We have the travel size and love it. It sits next to our sink and holds about a gallon of fresh, filtered water. It is our daily drinking water, our cooking water, and our emergency water plan all in one. It is the perfect size for two or three people. This is the smallest of their filters and I believe there are six in the line. 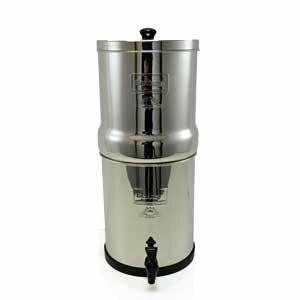 Berkey Water Filters are actually designated as water purifiers. Berkey Water Filters were designed to filter dirty water in rough conditions in remote locations. "Berkey water filters provide the ultimate in waterbourne contamination removal. They are used worldwide to set the international standard for water filters used in clean or hostile filtration environments. Owning a Berkey Water Filter gives you the ability to utilize almost any outside natural water source and transform it into the best tasting, purest drinking water possible. All while using a natural method without the use of chemicals or complicated processes." The travel size is excellent for car camping. If you are considering purchasing property with a catchment water system, I would highly recommend this water purifier for drinking water and would not hesitate to use it in that fashion. If you live somewhere that is subject to natural disasters (earthquake, hurricane, lava), this filter system can be a part of your emergency water storage system. You can filter rain water or groundwater, etc. It is simple to use an maintain. Filters are changed rarely (per every 6,000 gallons) and are easy to change. When you first set up your filter, you receive dye to place up in the top chamber to check to make sure that only filtered water is present in the lower chamber. If there are any leaks due to improper installation, you will know it instantly. No dye in the lower chamber? You are good to go. They dye packet comes with the replacement filters as well so you can have the confidence you are swapping the filters out properly. Even though we are on city water here, we continue to use our Berkey filter for our drinking water as the taste of the water is excellent and we have the confidence to know that any impurities are filtered out (including viruses). If you have been looking for a filter system that is a step up from your Britta, and you need something for your emergency back up plan (filters mounted to your water line won't work for this), consider the Berkey. I can personally attest to it's function and value.